During Ingram's time at the Academy, he was a member of the school's rowing, track and football teams, leading the latter team to the Midshipmen's first victory in six years over their bitter rivals from Army by scoring the lone touchdown in the 1906 clash. His athletic exploits helped earn him the Academy's prestigious Athletic Sword and induction into the College Football Hall of Fame in 1968. Following his graduation in 1907, Ingram served in several battleships, cruisers and destroyers. As turret officer of the battleship Arkansas (BB-33), he established a world's record for firing 12-inch (305 mm) guns. On April 22, 1914 he landed at Veracruz, Mexico with the Arkansas battalion and was later received the Medal of Honor for "distinguished conduct in battle" and "skillful and efficient handling of the artillery and machine guns". Ingram served as head football coach at the Naval Academy from 1915 to 1917. During World War I he was awarded the Navy Cross for his services on the staff of Rear Admiral Hugh Rodman Commander, Division Nine, Battle Force, Atlantic Fleet. Earning the rank of Commander in 1924, he became the commanding officer of the destroyer Stoddert (DD-302) before returning to the U.S. Naval Academy to serve as both athletic director and football director from 1926 to 1930. Ingram moved on to command the battleship Pennsylvania (BB-38) for a period of time after that, before serving as Officer-in-Charge of the Public Relations Branch. Prior to his promotion to Captain in 1935, Ingram served as an aide to the Secretary of the Navy, then returned to the sea as commander of Destroyer Squadron Six. Ashore, he was Captain of the Yard, New York Navy Yard in Brooklyn, New York before returning to sea, in command of the battleship Tennessee (BB-43). In the early years of World War II, Ingram was promoted to Rear Admiral on January 10, 1941 and served as Commander Task Force Three prior to his designation in September 1942 as Commander South Atlantic Force, U.S. Atlantic Fleet, with the rank of Vice Admiral. This force, with headquarters in Brazil, guarded shipping in the coastal waters south of the Equator and throughout the United States zone of responsibility in the South Atlantic. 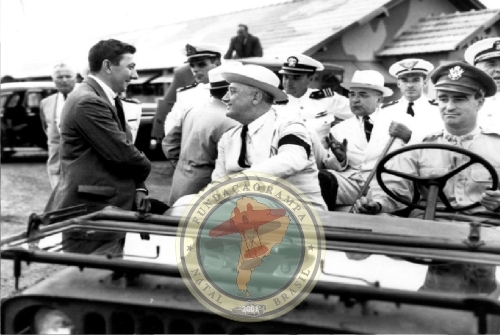 Admiral Ingram's command included air and surface units of Brazil which were brought to a high state of efficiency through his leadership and coordinating efforts. 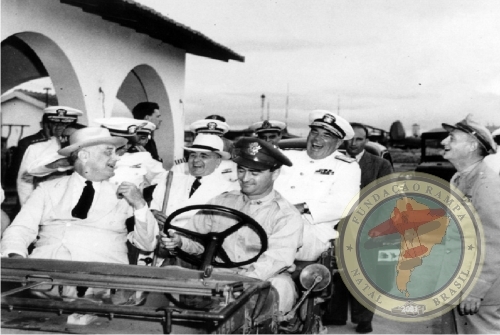 The ability to develop and maintain harmony and close cooperation with Brazilian naval forces contributed to the control of the South Atlantic achieved by the Allies. 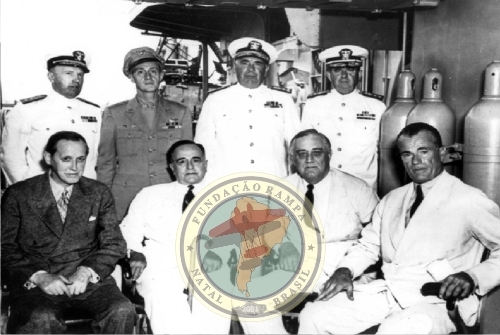 He assumed personal responsibility for properly equipping and training the Brazilian Navy and for their combat operations against U-Boats and German raiders and later for the important task of maintaining the air and sea rescue patrol for ultimate deployment in the Pacific. For his services in these important commands, he was awarded the Distinguished Service Medal and a gold award star in lieu of a second. On November 15, 1944, he was appointed Commander-in-Chief, U.S. Atlantic Fleet, with the rank of Admiral. In this command he played a major role in assuring the steady flow of troops and materials to Europe across the Atlantic during the later phases of World War II. He also directed Atlantic Fleet efforts in containing and destroying the German U-Boat fleet. For exceptionally meritorious service during his command, he was awarded a gold award star in lieu of a third Distinguished Service Medal. Task Group 22.3 Commander, Captain D. V. Gallery, presenting U-505's flag to ADM Jonas H. Ingram at Navy Department, Washington D.C.
Edited by BEAST, 18 October 2011 - 07:45 AM. Detached from duty as Commander-in-Chief, U.S. Atlantic Fleet, during September 1946, he subsequently retired from active duty on April 1, 1947 after 44 years of service. Ingram was named commissioner of the All-America Football Conference. Serving until resigning in 1949, Ingram went on to serve as a vice president for the Reynolds Metal Company. In August 1952, he suffered a heart attack while serving as the superintendent of summer schools at Culver Academies, then was stricken again with another attack on September 9, while at the U.S. Naval Hospital in San Diego, California. He died the following evening. Kind of a coincidence, uniforms of two successive WW2 CinCs Atlantic Fleet have been posted here in recent months (Ingersoll and Ingram). 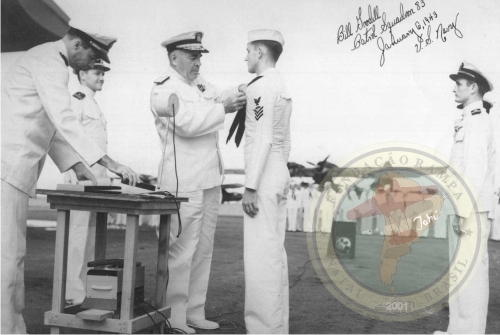 One of several Mexico Navy MoH recipients that went on to big things. Great jacket, thanks for the post! Excellent uniform and history. As previously stated, thank you for sharing! Great uniform!! Thank you for sharing!! I very liked to see the Brazil connection. I can't remember where I read it, but IIRC Ingram, though not qualified as a USN aviator, did get a private pilot's license and was awarded Brazilian pilot's wings. You can see him wearing them on his USN uniform in some wartime photos. Thanks for mentioning this. I never noticed them on the photos until you brought it up. This is an image that was sold on eBay recently. Edited by DesertRatTom, 25 May 2014 - 06:24 PM. Thanks for posting that photo, it's a nice one. You can see on his left arm that he's wearing the wartime "half" rank lace, something that's not always visible in photos. Thanks for posting the wings also, Ricardo. Looks like a match! I have never noticed the "half lace" before--can anyone explain why it was used? It was a wartime economy measure to conserve material, which was also done by the British Royal Navy during the war. 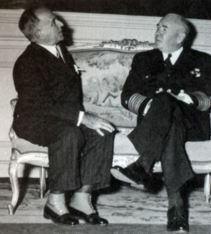 The wartime CNO, Admiral King, made several moves that he intended to simplify officers' uniforms for wartime. The most famous is the unpopular gray working uniform in place of khaki, but he also tinkered with blues. After mid-1943, the pre-war Service Dress Blue, with full lace around the sleeves, was classified as a "dress" uniform. The "service" blues were basically the same but with the "half" lace, and also with a gray shirt (with optional collar rank devices) instead of white, and the option of black chinstrap on the cap instead of gold and no scrambled eggs on the visor for commanders and up, or a blue garrison cap. The half lace and plain caps were supposed to be mandatory after October 1943 but many officers did not comply and the wartime caps later became officially optional. Another unpopular pet uniform of Admiral King's was "Service Dress E," which was dress white on top and blues on the bottom. Great information, thanks fopr sharing it!! Well, thanks to the same USMF member, I was able to acquire his 1907 dated frock. 1907 is the year in which he graduated from the US Naval Academy. This sold on eBay at the same time as his midshipman's jacket. Also included but not shown is his undress belt. I just received his records and will post additional information on his awards soon. Here is the dated tailor's label from the frock. Wow, another great addition for this admiral. The ensign stripe would have been put on in 1909, from '07-'09 the stripe would have been half width (quarter-inch) as a graduate midshipman, during which time Ingram served in USS Nebraska as part of the Great White Fleet. Nice work, keep 'em coming! Thanks to everyone for their comments! Justin, thank you for providing a timeline for this coat. I thought I would show some of the documentation for his foreign awards. While the reading of orders is not always interesting, keep reading as their is an interesting twist in this man's career! First up is his letter requesting permission to wear the Order of the Southern Cross awarded by Brazil. Edited by BEAST, 20 April 2012 - 06:18 AM. His receipt for his WWI Victory Medal with Grand Fleet clasp.